Hanoi (VNA) – At least five people were killed and 15 others went missing during downpours and floods in several northern mountainous provinces from August 1-3. 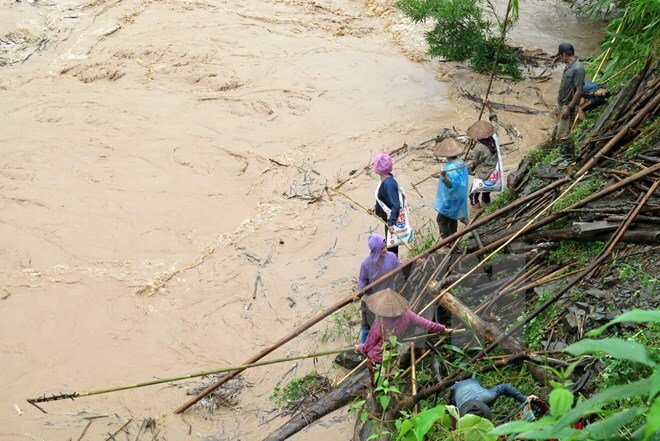 The victims are from Bac Kan, Lai Chau, Dien Bien, Yen Bai and Son La provinces, the Central Steering Committee for Natural Disaster Prevention and Control reported on August 3. Torrential rains also damaged 87 houses, submerged 5 hectares of farming land, swept away 61 heads of cattle and poultry, and triggered landslides on national and provincial roads in the localities. Local authorities visited families of the victims and mobilised forces to help residents in the flood-hit areas overcome consequences caused by the natural disasters and stabilise their lives. The Central Steering Committee for Natural Disaster Prevention and Control on August 2 asked provincial steering boards for natural disaster prevention, search and rescue to keep a close watch on the development of downpours and floods and update all-level authorities and people on the situation to take timely response measures.